Neural Network or ULE module generates a projection line based on those cycles found in step 1. So everything below is shown for S&P500 daily data. You can easily apply this technology for any other financial instrument. Whatever financial instrument you choose, these are the steps you have to do while creating the forecast. Once again, I will not discuss here the main idea of this approach or any small detail; see it in classes above. For each step, I will show what I usually do. 1) Data: how many data do you need? For daily data I use 4-10 years of price history. The usage of bigger price history does not change the situation, it only takes more time for calculations. 2) Forecast horizon. 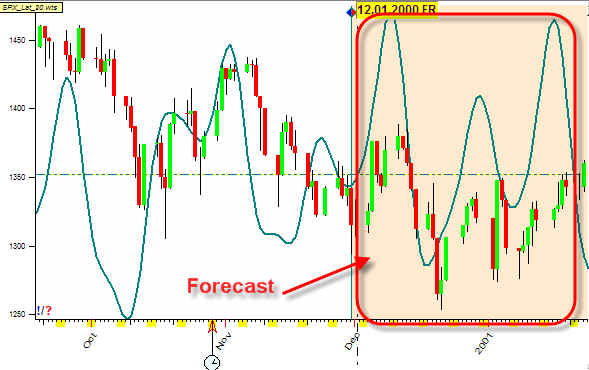 This method provides forecast 2-4 weeks ahead. 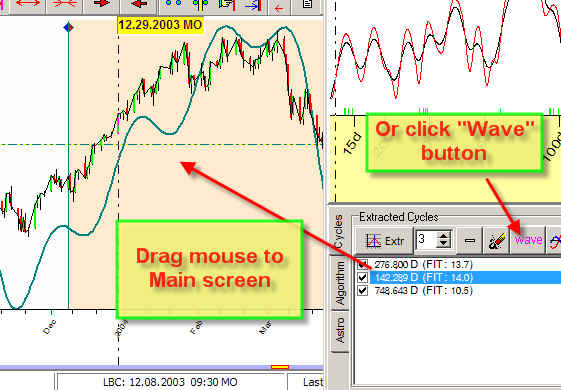 3) Pay attention to short term cycles. When you run the Spectrum module, it is better to adjust it by revealing the short term cycles. It seems to me that the best way to do that is using the short term relative price oscillator as a target for Spectrum module. The short term cycles are not so visible here as they are in the previous diagram. Thus to emphasize the short term cycles we use short term oscillator as a target for spectrogram. 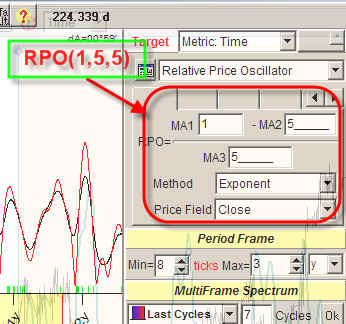 We may try as well the supershort oscillator RPO(1,2,2). I have found that for most financial instruments this parameter should be between 5 and 10. I use here 7. 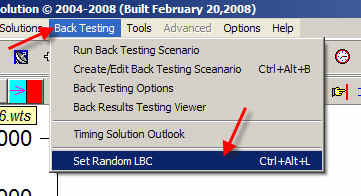 With this setting, a weekly cycle is skipped. 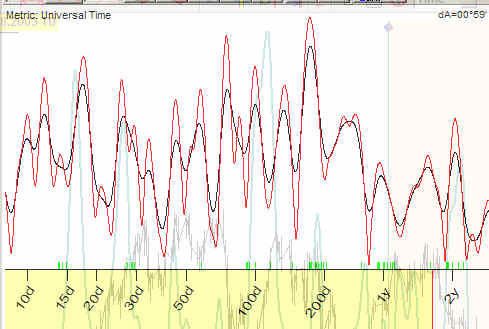 It is very interesting that usually we can see the 7 days weekly cycle on spectrum diagrams, though its application for modeling the price movement does not provide any remarkable results. It might be that the usage of shorter cycles opens the door to Chaos. 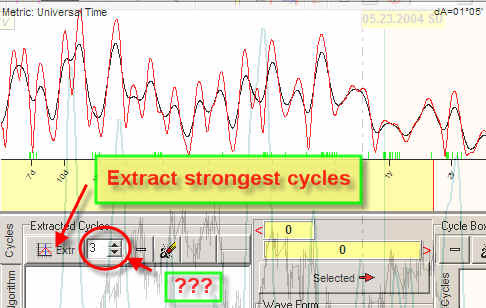 Here the question arises: how many major cycles is it better to extract? The experience shows that 2-4 cycles is enough. Do not use too many cycles. You will not get improved results, only a confusion. Sometimes I use only 1 overtone. Do not use many overtones as it is a door for Chaos. Keep it locked! The same result may be achieved by clicking "Wave" button. 9) Final recommendation. Keep your mind cold as the ice and clear as the crystal. You may be confused by the general appearance of your projection line - it might be not ideal or beautiful or it might be simply a bad one. Usually some users in this situation add more overtones, apply more cycles, etc. Sometimes they get a better looking projection line - though for just one particular case. This picture disappeared when LBC is moved or new data added. What can I say? Before claiming your projection line as "the one", move LBC several times and repeat the whole procedure for different LBC positions (i.e., calculate Spectrum, extract cycles, generate the projection line). And remember that sometimes you may not find a good enough projection line at all. Accept this, - and try again later, with new data. I use this option a lot for checking my models.